In retail banking, the communication strategy of credit institutions is facing new challenges. Beyond the cyclical impact of the crisis, new ways to “consume” banking seem to emerge. 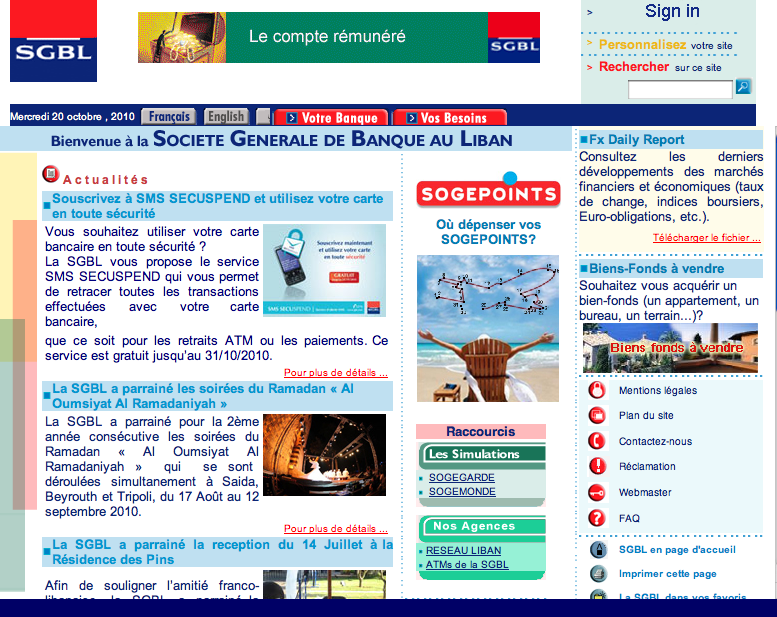 Lebanese banks should definitely start thinking how to redirect their traditional communication campaigns and tools. Communication strategies are usually required to follow the development of new technologies that impact the consumers’ behavior. All around the world, it has even become common to use the Internet or mobile phone for banking transactions. 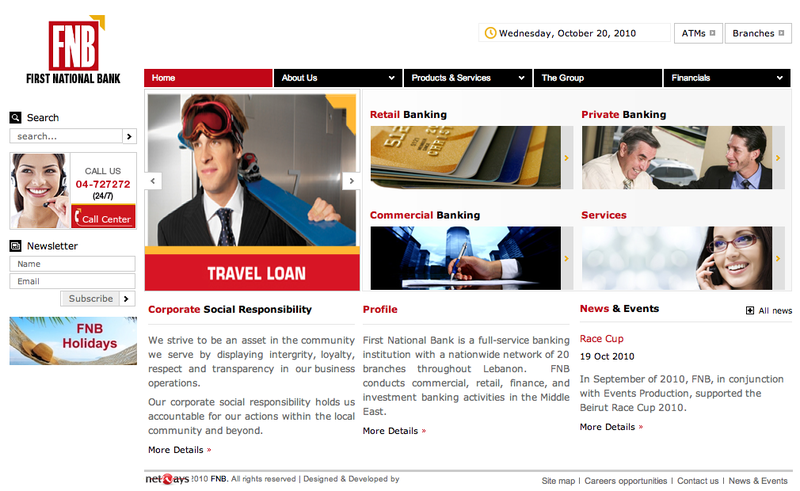 So even if all the major Lebanese banks have created web portals, they are far (faaaaaaaar) from being present in all territories that new technologies have created. These territories include new audiences generated by social networks that are growing surprisingly. The challenge for the banking sector lies in the conquest of these new spaces and the seduction of their audiences. First, banks should start positioning themselves on the new audiences crossroads that are distinct and separate from traditional media’s audience. Social networks are new contact points banks need to exploit. These channels should be progressively integrated to communication strategies because they allow banks to be visible among a population of Young adults, which is a particularly attractive target for banks. But beyond visibility, these new means of communication offer the opportunity to interact directly with customers. Secondly, banks should really be thinking about developing real branding strategies, stop acting like companies only and start acting like real « brands ». While they have almost all a very strong reputation, only a few banks have managed to build a strong identity around specific and distinctive attributes easily identifiable by the client. The promotion of a brand is only possible if it is linked with a promise and values that are in line with customer expectations. In this framework, communication actions taken by banks should above all, relay and make the brand promise more credible. In this era, consumer’s behavior and clients fields of expression have radically changed. So why not use the web to set the tone for a new more collaborative customer relationship? 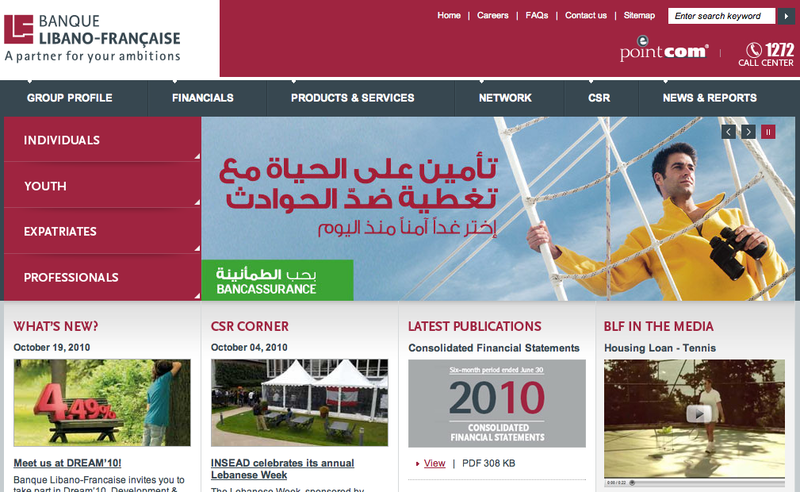 This entry was posted in Digital and Social Media, Only in Leb and tagged bank audi, bank byblos, banks, banque libano-francaise, BLF, Communication, first national bank, FNB, internet, lebanese, lebanon, online, strategy, web, website. Bookmark the permalink. 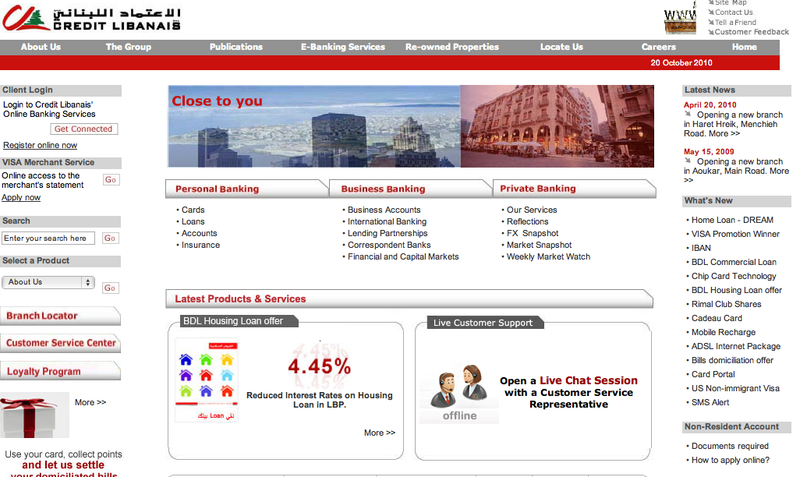 Great topic – its quite sad to see the dismal of banking websites. 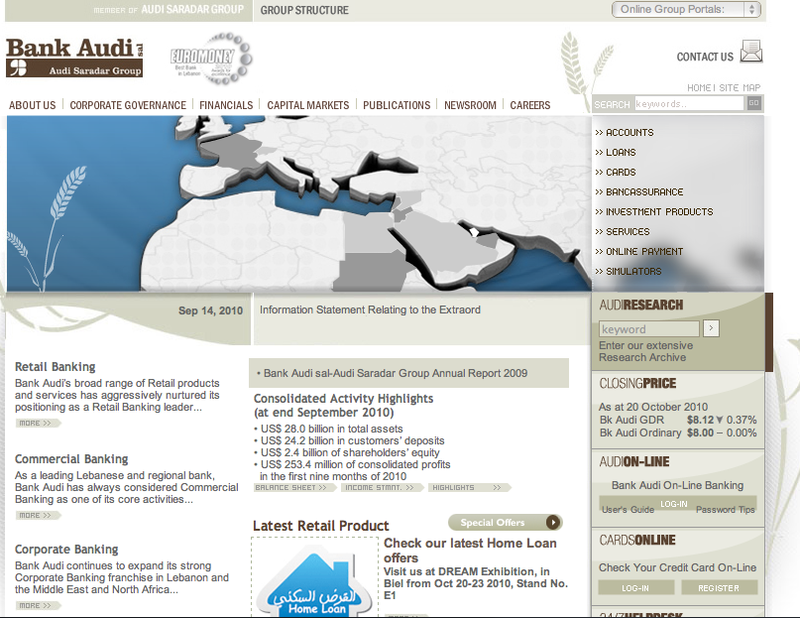 I’m glad to see that you didn’t check out Bank of Beirut; that one would probably need an entire blog on its own. Whaow ! 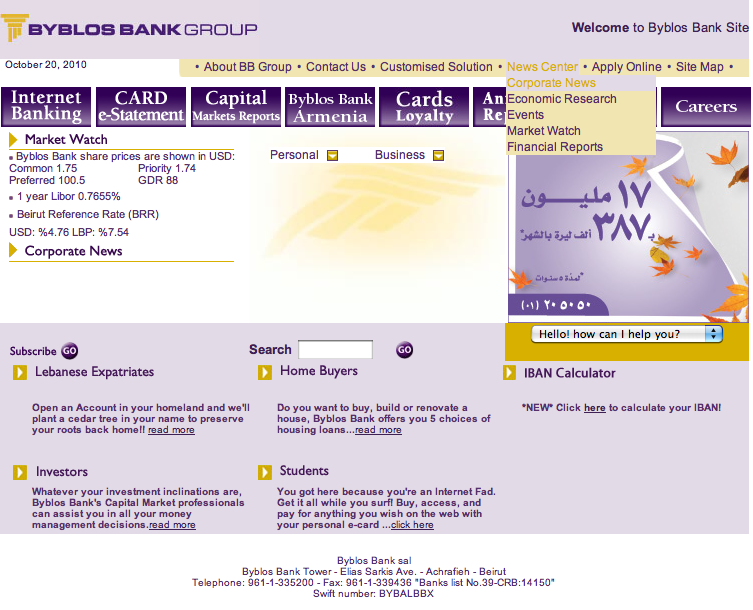 I couldn’t imagine that a bank, even a small one would accept to have such a has-been website than those you show us.